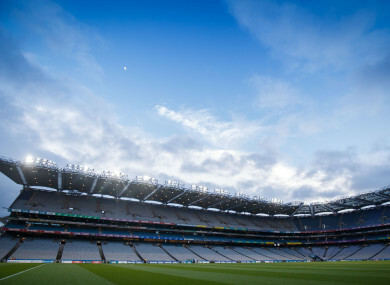 Who will progress to the 2019 football league finals in Croke Park? THE FINAL ROUND of the 2019 Allianz football league is pencilled in for this Sunday afternoon with league final placings, promotion races and relegation battles set to be decided. Here are all the permutations across the four divisions with a reminder that head-to-head is used to split teams if two are joined together and scoring difference coming into play if more than two teams finish on the same number of points. Kerry (1o points), Galway and Mayo (both 8) and Tyrone (7) are all in with a chance of reaching the final. A win or draw will guarantee Kerry’s progression while scoring difference could also work in their favour if Galway and Mayo end up joining them on 10 points. If Galway win they will progress as they can better Mayo if head-to-head comes into play, while a draw would also suffice if Mayo draw or lose. Mayo must win and hope Tyrone do them a favour. Tyrone’s chances revolve around a win over Galway and Mayo losing to Monaghan. Dublin are the only side in the division who have nothing to play for on Sunday. The relegation battle is between Cavan (2 points), Roscommon (3) and Monaghan (4). Cavan must win, hope Monaghan draw with Mayo and Roscommon lose to Kerry, while also improving their scoring difference. Monaghan are definitely safe if they win or if Roscommon lose. A loss for Monaghan and a draw for Roscommon can see them demoted. Meath are on the cusp of promotion on 10 points. A win or draw at home to Fermanagh on Sunday rubber-stamps their graduation but even if they lose they’d need to suffer a heavy defeat and for Donegal to win so as to not finish in the top two. That latter scenario would see Meath (+20), Fermanagh (+2) and Donegal (+5) all finish top together with scoring difference currently weighted in the Royals favour. Donegal will be aiming to beat Kildare and hope for a Meath victory. If Donegal and Fermanagh finish level, the head-to-head record swings in Fermanagh’s favour. Kildare (7 points) must win in that away game against Donegal and hope Fermanagh lose if their outside hopes are to be realised of promotion. Armagh are safe leaving the Munster trio of Clare (-8), Tipperary (-9) and Cork (-22) all locked together on three points. Cork need to beat Armagh and hope Tipperary win or draw against Clare to survive. If Clare win they will escape while if Tipperary win, they’d need Armagh to get a positive result against Cork. Draws in both games involving the Munster counties would see Cork and Tipperary relegated due to Clare’s superior scoring difference. Last weekend’s postponement of the Louth and Westmeath game complicates the promotion picture here. Currently Down (10), Laois (8), Westmeath and Longford (both 7), and Louth (6) are all in with a chance of going up. If Down win or draw at home to Louth on Sunday, they will be promoted and similarly a win for Laois over Carlow could be sufficient for them. If Westmeath or Louth pick up full points from their last two games, they would enter the frame, while Longford will also pursue a win to keep their hopes alive. At the bottom Sligo are already relegated. Offaly (3 points) must beat them away from home in their last game while hoping Carlow (5 points) lose to Laois and then the head-to-head factor would favour Offaly. Everything has already been wrapped up in this tier with Derry and Leitrim having bagged the promotion places. They will meet in the Division 4 league final on the weekend of 30-31 March. This weekend’s final series of games are split between Saturday and Sunday. * - An earlier version of this article incorrectly stated the points of some counties in Division 1. Tyrone (7 points), Monaghan (4) and Roscommon (3) is the state of play ahead of Sunday’s game. Email “Explainer: What's at stake for each county in the last round of the GAA football league?”. Feedback on “Explainer: What's at stake for each county in the last round of the GAA football league?”.